Australia medal tally at the Rio Olympics: are we on track? Rio 2016: We're halfway through the Olympics, are we doing better than last time? Australia’s medal tally at the London 2012 Olympics was the worst result at an Olympic games this century, and the worst since Barcelona in 1992. Australian sporting fans take enormous pride in our athletes punching above their weight at the Games, but they are equally as scathing when our Olympians don’t bring home the bacon. So now that we’re halfway through the competition in Rio, are we doing better than last time? We thought we’d put you out of your misery quickly — Australia is performing better at the Rio Games at the end of day eight than it did in London up to the same point. With 22 medals, including six gold, our team has eclipsed London’s total of 20 medals including one gold on day eight. But it’s not all good news — our Rio Olympic team is still lagging far behind the halfway total for the other Games of this century: Sydney, Athens and Beijing, though Australia’s gold medal haul for the first half is only two shy of the latter. The swimming has finished, and that&apos;s a big deal. By day eight of the competition, the short course swimming events at each Olympics are over, so our chances of winning medals in the second half of competition are much slimmer. Over the past four Olympics, swimming has made up 32 per cent of Australian medals, and 35 per cent of Australian gold medals. 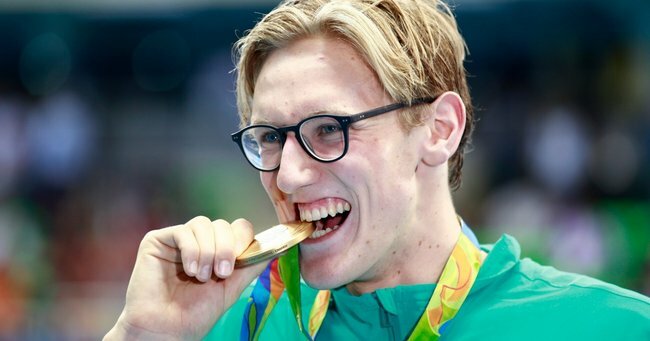 Swimming medals make a significant contribution to Australia&apos;s medal and gold medal tally — when our swimmers miss out, our tally is significantly lower. Australia&apos;s result of 10 medals, including three gold, in the pool is better than London&apos;s result of eight medals including one gold, but still worse than the results of Sydney, Athens and Beijing. Our athletes typically get fewer medals in the second half of competition than in the first. On average, Australia has won 28.5 medals in the first eight days of competition at Olympic Games this century (not including Rio), compared to an average of 18.75 medals in the final eight days of the competition. In terms of gold medals this century, Australia has won an average of 7.25 in the first half, and 6.25 in the second half, although the former figure is skewed by Australia&apos;s dismal performance in London, where only a single gold had been collected at the end of day eight. It&apos;s time to hustle — whilst Sydney&apos;s total medal tally of 58 medals is looking out of reach, we could catch the benchmarks set at the other Olympics. Australia would need to win a further 37 medals to beat Sydney&apos;s record result, 29 medals to beat Athens, 25 medals to beat Beijing and 14 medals to beat London. In terms of gold, we need 11 to beat Sydney, 12 to beat Athens&apos; record haul, nine to beat Beijing, and three to beat London. If the average number of medals won in the second half over the past four games were won at Rio (allowing for rounding, of course), we&apos;d be in front of London, but behind Sydney, Athens and Beijing. Looking at gold medals alone, if we pick up the average number of second-half gold, the rankings would be the same. Australia&apos;s medal and gold medal prospects for the second half are a mixed bag. Medals won in the second half of recent Olympics are dominated by three sports; athletics, track cycling and sailing make up more than 50 per cent of the second half medal tally. These three disciplines, plus kayak/canoe sports make up more than 50 per cent of the second-half gold medal tally for this century. Australia also relies heavily on team ball sports to beef up the medal tally in the second half, including hockey, basketball, water polo, softball and baseball, though most medals won in these sports are either silver or bronze. To see all of our remaining medal hopes for the second half of the games, including when to watch them, check out this list.